Luxury. First class service. Fantastic food. These are the things we guarantee at our luxurious wedding venue in South Wales. The writing is on the wall. 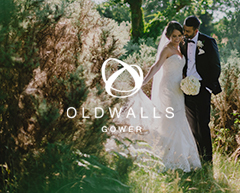 Our sister venue Oldwalls Gower has been voted the best wedding venue in Wales for three consecutive years. We promise to inject our award-winning formula into your special day. We believe that special moments should happen in the most enchanting of locations. Our newly refurbished grade-2-listed venue, nestled within 24 acres of breathtaking grounds, offers a truly unique wedding destination. Exclusivity comes as standard, not an exception. When you set the date at Fairyhill, you get the whole house to play with and we’ve been working hard behind our grand old doors to offer 'something new'. In the first months of 2018, Fairyhill underwent a stunning transformation, proudly offering a stunning new addition to our collection of world-class South Wales wedding venues. The K Room is a striking glass construction designed especially to host weddings. The contemporary space perfectly juxtaposes our chocolate-box-pretty Georgian mansion that has captured the hearts of South Wales for over a century. Combining a pinch of 21st century cool with the charm and character of the original house - the contrast is simply EPIC.